No matter what form of competition, if Boston University and Boston College are in a battle for superiority I need to see my Terriers win. This extends to hockey and two students trying to get a taxi. Seriously, any competition imaginable needs BU to come out victorious. Tonight is no different. One of my big projects this summer for BU Athletics has been to help set up the 2015 Terrier Tailgate. One of my favorite times of the year is when the new students will move into BU for the first time. These kids are all great at giving the outward impression that they aren’t overwhelmed by being on their own. I was like this too once upon a time. I probably deserve a retroactive Oscar for my ability to conceal that I was going to have a breakdown over laundry on day 3. But now that the students are here and settled, however slightly, on campus, it’s time to show them some fun. That’s where the Tailgate comes in. Boston College is our rival, again, in every and anything. We need to get these Terrier puppies down with booing the Eagles. 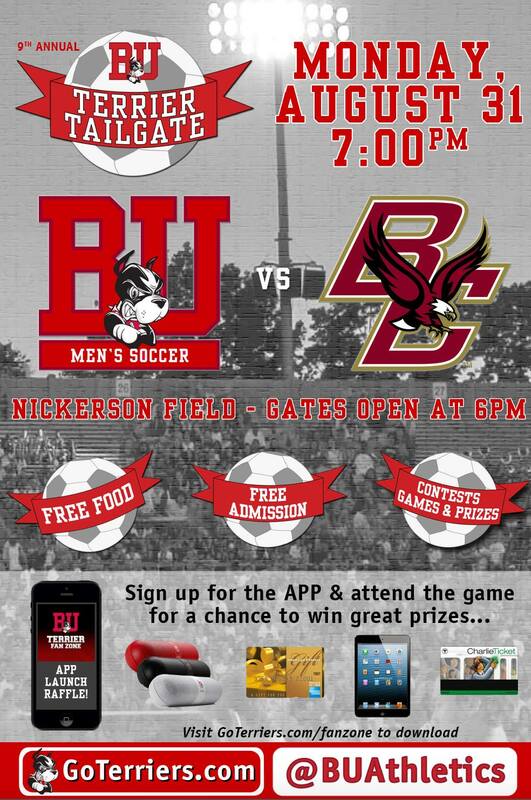 Tonight the Terriers and Eagles are playing men’s soccer at Nickerson Field here in BU’s west campus. We in Athletics decided that we wanted to make this game in to a welcoming block party of sorts. How do we do that? Well, for one we get people prepared to beat BC tonight. On a larger scale, we announce we are raffling off some Beats Pill speakers, an iPad, a big cash gift card, and a semester pass for the MBTA. 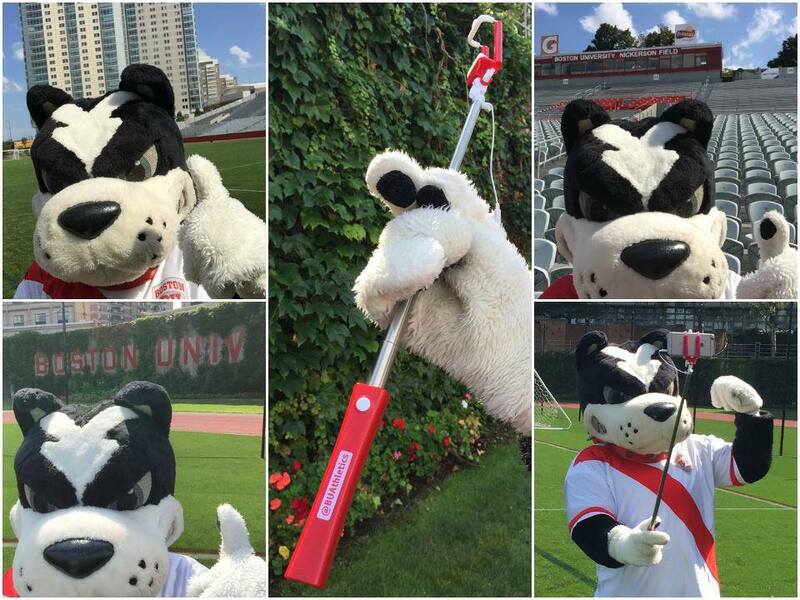 Then we announce that the first 300 through the door will get a special, limited-edition BU selfie stick. I’m embarrassed by the fact that I will most likely be taking one of these for myself. But even more fun is that the kids don’t know that there is way more to come at the event tonight. Free food? Not just some popcorn, we got a truck load of Raising Cane’s chicken fingers – better known as the most delicious treats to be found on BU’s campus. Then there are even more games to be played around the stadium before kickoff. Dunk tanks, big inflatable soccer goals – you name it, we have it. Oh, and everyone can come tonight free. Doesn’t matter what year you are, BU or BC, the admission is free. Bring everyone you know. On the whole, the Terrier Tailgate is a bit like my baby. Not only are we heading into my third year working for BU Athletics, but potentially one of the most special seasons on the whole for all the university’s teams. They tossed me the Tailgate and told me to see if we could get some people interested. Well, as of this morning there were 4,000+ set up to come to the game on Facebook. If we even come remotely close to that number this will be a success. If you are reading this and are not doing anything tonight – come to this game. This is, no hyperbole, the event of the Summer for Boston U. Tonight is going to get the school year started right.